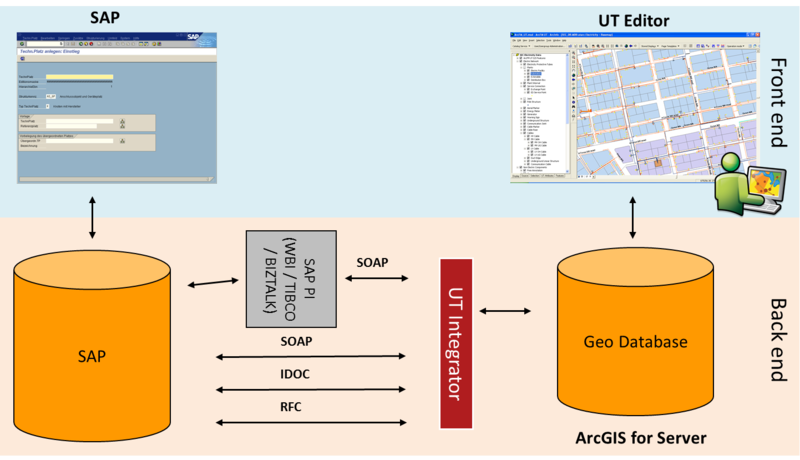 UT Integrator offers real-time integration with other databases at the level of the UT data model based on ArcGIS for Server. Dependent of your business logic, either the GIS or the remote IT system (e.g. SAP) may be the leading system. The SOAP / XML interface is a widely used interface. This interface may also be used to integrate with other Enterprise Buses (e.g. WBI, Biztalk, SAP PI etc.). For certain integration use cases, also the table reader or CSV file reader interfaces are useful tools. Especially when integrating with SCADA systems, typically the ASCII-based interface is used. A very elegant and easy method of creating smooth, web-based workflows is to simply call the user interface (GUI) of the other IT system. This frontend integration requires the databases of GIS and SAP to be referenced to each other through backend integration. 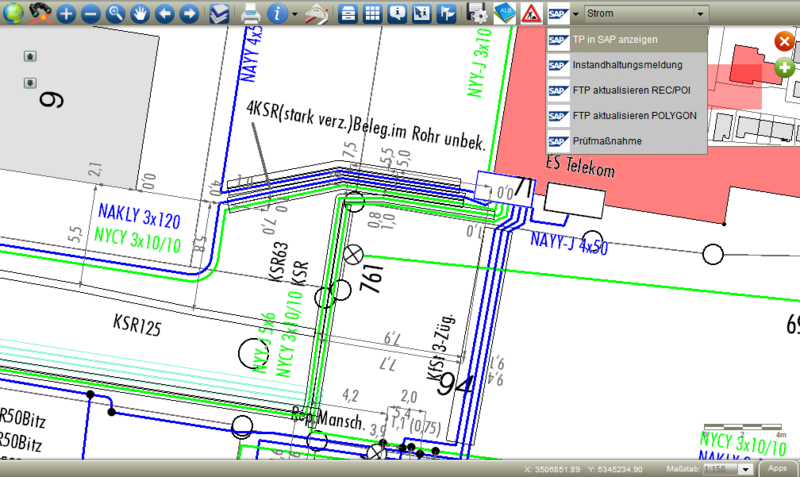 AED-SICAD developed specific expertise in integrating SAP masks and GIS maps and functionality into one web-based window. 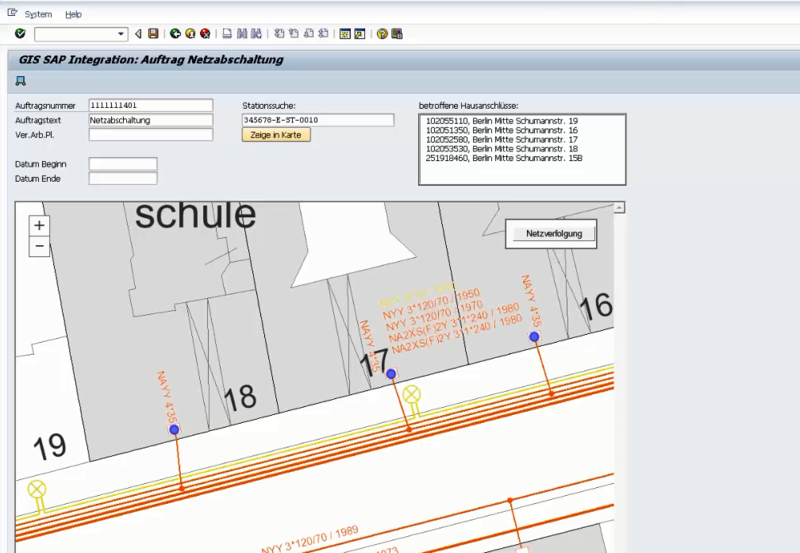 This allows end users to access within a certain role and a certain business process only those SAP and GIS functions and data which they really need in this very moment. The databases of the respective systems (SAP / GIS) are accessed directly, no duplication of e.g. GIS database is required. Example: Find downstream customers by executing the UT Server tracing functions and creating a shutoff notification within SAP – all within one web user interface!